Yesterday, Microsoft did what many of us were thinking they would never, ever do: they fixed VDA. 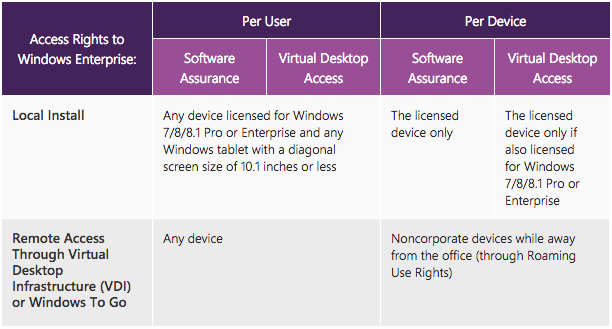 Windows can now be licensed on a per-user level instead of per-device. Yesterday, Microsoft did what many of us were thinking they would never, ever do: they fixed VDA. Windows can now be licensed on a per-user level instead of per-device. I even wrote about how I didn’t think the #FixVDA movement would work, but I was wrong. There’s no more restrictions on whether or not you have a Surface tablet, or an company-owned iPad being used off-premises versus on-premises. There’s no more having to roll out Windows Server instead of a desktop OS to get around the exorbitant license costs. There’s no more failed projects because licensing costs suddenly tripled. Hell, Brian can probably join the MVP program again! I thought it was April Fool’s day or some new, comedy website-created November version of it. “Nonsense November, brought to you by Cracked” or something like that. I swear we almost wrote a fake article about this very thing on April Fool’s day this past year, but we thought it would be taken too seriously and we didn’t want to confuse the issue anymore. (We’ve accidentally done that in the past with Luflogix and pDesk.) We should have–it would have been one heck of a scoop. Let’s take a look at what the change means for us, and what it doesn’t. As mentioned above, Microsoft has relaxed on Windows licensing and made it more in line with what we were pretty much doing already anyway–buying one license of Windows per user. Now it’s not something the BSA can slam you for (not the Boy Scouts of America, although they would frown on that too under the “Trustworthy” and “Obedient” clauses). Of course there are limitations. You must have Software Assurance (assigned to the user now, too), which allows the user to access Windows Enterprise running in a VDI instance. Neither of these are that big of a deal, though, especially given the old way of $100/device VDA licenses except in certain circumstances. There are local install provisions with the new licensing model, too. According to the chart that was posted along with the announcement, “Any device licensed for Windows 7 / 8 / 8.1 Pro or Enterprise and any Windows tablet with a diagonal screen size of 10.1 inches or less” also falls under the new per-user policy. I interpret that as saying that any user covered under SA for any OS from Windows 7 and up can use any device they want. Why that Windows tablet stipulation is in there, I’m not sure. The bottom line is that this is what every company has been waiting for: a choice between per-user and per-device and no insane decision tree to determine if you have to buy VDA or if a device is covered under SA. Just good, simple, licensing. That said, it’s only half the battle in the desktop virtualization world. Enterprises are going to be thrilled with the news unless the check they wrote for VDA just cleared. DaaS providers, on the other hand, are still forced to run each customer’s desktop VMs on separate hardware because there is no SPLA for Windows desktop OSes. They can still work around it by deploying server OSes instead, but in general this continues to put an artificial damper on the DaaS space. Though I’m somewhat disenchanted by the lack of a SPLA addition, I think this announcement means that it’s only a matter of time. Shifting to a per-user mentality is a precursor to allowing those users to access any desktop regardless of the hardware. In fact, a change like this had to happen first. Whether or not Microsoft acts soon to change SPLA remains to be seen, but don’t hold your breath. Though Microsoft seems to be doing a lot of things right these days, they’ll still only make a change when it behooves them. The day you see Microsoft add a SPLA to a Windows Desktop OS is likely the same day they announce their own DaaS solution. I could be wrong, too, since there’s a typical lack of details around this new licensing method. It’s possible that licensing Windows on a per-user basis allows users to log into ANY Windows desktop, whether or not the software is licensed by the same company as the user or not. I suspect that’s not the case, but it’s not out of the question. If there’s any gray area there, I’m sure people will be quick to exploit it! It's also possible that it will be significantly more expensive to buy the "per user" license, in which case I'll have to change the title of this article. I assume the new per-user VDA is more expensive than the per-device VDA. Essentially all they did was combine VDA with Companion Device License and remove its restrictions. If the new per-user VDA is more expensive, then this is yet another option that must be considered. In other words, licensing is still complicated. Does VDA cover RDS? If not then VDA is still not fixed because I need two different licenses to connect to RDSH and VDI. That's a really good point, and I was too caught up in all this newfound Microsoft optimism. I guess there's some wiggle room, though, where the per-user cost could be more than the per-device cost while still being cheaper than the loaded cost of CDL + VDA year/year. I would argue that at the very least it's less complicated this new way, though. There's less to consider. If you want X, you have to buy Y instead of "If you want X, you have to by Z, unless W or R is corporate owned, or if the employee has a surface tablet." Yes there'll be a price premium on the SA/VDA Per User option. It's the same also with RDS CALs currently whereby RDS Per User CALs have a price premium over their Per Device counterpart. For the Per User options - there are some restrictions for the local install - you get to install Windows Enterprise on your Win 7/8/8.1 Pro machines or Windows tablets up to 10.1" in diagonal screen size. For VDI access under the Per User licensing option - the door's pretty much wide open to access your virtual desktop from anywhere and any device. So none of that VDA + CSL scenarios with the weird restrictions. For those who already have SA/VDA coverage there is also a Per User Add-on option as well --- sort of a transition license per se - where you are turning your current Per Device licensing model to a Per User licensing model. The unfortunate thing is that is these Per User options aren't available under the smaller (SMB) Open/Open Value licensing programs. In addition to all of this --- it also ties into the new Enterprise Cloud Suite (ECS) Microsoft just announced that will be available in December. ECS = Office 365 E3 + Enterprise Mobility Suite (EMS) + Windows SA Per User. And VDA still costs more than SA so if you are an enterprise that only uses non-Windows client devices, there is still a VDA tax, but this is still a much cleaner option for users that access VDI from more than one device. I wonder, aloud, if Microsoft has done this after the recent announcements of Citrix and VMware to offer Linux VDI. Surely this is not coincidence to happen in the same month.